One reason naturals embrace their curls is for their love of versality. If you want to keep up with the trends without compromising your tresses, celebrity stylist Kiyah Wright has fabulous color techniques for extensions. Not only does Kiyah Wright reign supreme as color queen, but she has styled the crowns of Kerry Washington, Chaka Khan and Tyra Banks (the list goes on). She has also been the stylist behind the scenes of the Daytime Emmy Awards, MTV Awards and the Grammys. 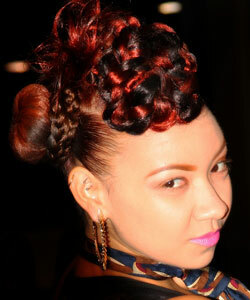 This Clairol Professional Celebrity Colorist took the crowd by storm as she lead a seminar on fall 2012 color trends at the Bronner Bros International Hair Show. Here are three tips that will help you achieve ombre highlights, vibrant red color and chalking on your wavy, curly and coily extensions. Chalking is an easy and fun way to experiment with bright hues! Either you or your stylist can bleach the extensions to the lightest blonde using a Clairol Professional Over 40 Volume Developer on the sections you want to place color. Once the extensions are bleached and the head is blow-dried, dampen those sections and roll sidewalk chalk in the desired hue up and down the hair. 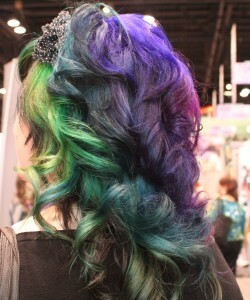 The color will transfer easily and won’t stain the hair. This is a great weekend look that washes out for the work week. To obtain bright reds a la Rihanna, put a semi-permanent hair color such as Clairol Professional Jazzing in Red Hot into a bowl, cover it with a hair cap and heat it up in the microwave for about thirty seconds. The heat will help to create a super vibrant color. Red in extension hair fades quickly, so do weekly touch-ups in the shower. Mix Jazzing in Red Hot with your shampoo (a 1:1 ratio) and use it when washing your hair. To achieve the ever popular ombre look seen on A-listers such as Drew Barrymore and Ciara, either you or your stylist can use Clairol Professional BW2 Powder Lightener to bleach the extensions. The lightener stops working after approximately 30 to 40 minutes, so if you rinse it out after 40 minutes and see an ashy hue, repeat the process. Extensions are a great way to experiment with color. They allow you to enhance or change up your look with color and protect your tresses, so that you can grab that vivacious red box color you've been dying to try.